We'd love to get in touch with you. All inquiries, questions and comments about our research are welcome, and we will respond shortly. Now that we are back at the CNSC, things are getting a little more organized in terms of when we have to wake up, eat breakfast, and eat dinner. The day ahead of us was going to be long and difficult, so what better way to start than with pancakes and sausages? After that, we hopped into the van and drove over to the rocks near the coast where we met up with Paul. To quote Michael: “He had a very adventurous beard.” Paul lives in Churchill with his wife and owns a family business called Nature First, where he works as a guide/polar bear guard. We walked across some rocks that dropped off into the ocean for about thirty minutes. There were many chances to stop, rest, or even climb down to the bay if you were up to it. After we got halfway to the destination we stopped and Paul told us a bit more about himself and his opinions towards tourism and researchers working up north. Following the thirty to forty minute talk, we walked across the beach and towards some more rocks and a rocky beach. We stayed there for about twenty minutes where we had some fun skipping rocks. Unfortunately, our fun had to come to an end and we had to head back to the cars so that we could go to the fens to eat lunch and finish our final two sets of transects. We drove about 40 minutes from the CNSC along a bumpy gravel road. The first one was on the right side of the road and was a tree fen, the meaning of which is pretty self explanatory: it was a fen with trees in it (something we hadn't encountered before). The two groups doing the probing had some of the toughest times working on this fen. The ground was rocky and the permafrost was very deep. We had a record of 207.3 cm deep at one point. Two and a half hours later we finally finished and got to the (almost) final piece of work on the trip. It was just across the road so it wasn't a problem to get there. This fen was much easier because pretty much the only things in the quadrats were water, water sedge, and the occasional single shrub. We rejoiced after finishing those transects by watching Kevin, Chris, Adam, Natalie, and Alexis jump into a pond in the fen. We quickly packed up, dried up, and began making our way back to the CNSC to eat a well deserved dinner consisting of chicken, shepherd's pie, rice, and salad. Next on the list of things to do today was go and get Thomas's probe that we had put at the Twin Lakes Bog almost a week earlier when we were doing transects there. We drove for about forty minutes, then hiked for about ten, until we found the open area with a beautiful backdrop of trees against the evening sky, and the probe in the middle. We stayed there for about half an hour so that Thomas could get his probe and we could take some pictures with the setting sun. half way through the hike back, we passed one of the Twin Lakes. The sun was setting right across the lake from us, so we decided to wait the extra half hour and watch the sun set from the mossy shoreline. Almost all the students decided that it would be an excellent idea to go wading through the peaty, squishy, but apparently delightful mud resting on the bottom of the lake. A few even made the few hundred meter walk to the other side of the lake and back. Ensuing the dip in the lake, we walked back to the cars, picking up some branches to start and sustain a fire the net morning. When we got back to the CNSC we had some time before we met in the classroom and spent about an hour and a half listening to my music and going through all of Chris's (our student photographer) most recent pictures. He had some particularly beautiful ones of the sunset over the twin lake and another small lake we passed by on the way home. Finally at 11:30, we were able to go upstairs to the dorm, and doze off to sleep. It’s crazy how you can develop such a deep connection to a place in such a short time. This is something that all of us realized this morning, when waking up and realizing that the helicopter was soon on it’s way to come and remove us from our five-building, fenced-in temporary home. Breakfast of apple crisp leftover from the night before and pancakes was eaten in a hurry while people made sure that their stuff from the week was all packed up, field gear was organized, dishes were done, and general clean-up was finished in hopes of leaving the place looking nicer than it had when we arrived. The mood of leaving was bittersweet, (the sweet mostly coming with the promise of showers and clean clothes upon our arrival to the CNSC) and the race this time around was for who was taking the last helicopter ride back, as opposed to the first one in. The reality of leaving didn’t truly hit me until the very last moment when the helicopter lifted off the ground and I had a moment of wishing that I could just open the door and jump out because I didn’t actually want to leave Nester One today, or ever, because no amount of time is enough to spend in a place as beautiful as that. The last glimpse of Nester One from the helicopter is something that I’ll never forget. As we lifted off, I was overwhelmed with a feeling of just how small we are, and looking back after only about a minute of flying, I could barely pick out the tiny camp that we had called home for a week among the seemingly unending landscape on lakes, beach ridges and vegetation. On the ride back we saw yet another momma bear and her cub relaxing in between lakes, a perfect closure to a perfect week spent in one of the most beautiful and awe-inspiring places I’ve ever had the privilege to be. Once we arrived back at Nester One the first order of business was mandatory showers for everyone in the group, and a much appreciated and needed change into fresh clothes. Directly following that was lunch, where we all happily stuffed our faces with food that hadn’t been prepared by our own hands and reveled in the fact that it took more than ten steps to reach the kitchen from our own rooms. Once those necessary things had been taken care of, it was time for some data entry. The group was relatively spread out, enjoying our newly found space from each other and did our best to work through the haze of “wow I wish I were napping right now,” and get some work done. A few hiccups with misnumbered soil sampling trays and such things, but we made it through and happily reconvened for supper then a meeting to discuss highs and lows of the trip, (exponentially more highs than lows, no-one was surprised) talk a bit about planning for the remaining 34 hours of the trip, then watch a documentary on a couple following the migration of caribou through into Alaska. The documentary really hit home with a lot of us, especially having encountered many of the same animals and freezing camping experiences that this couple did, making it seem a lot more real, and bringing into perspective that getting to see a caribou pee at us to mark their territory, watch a polar bear hang out with her two little cubs under the sunset, or see little fox pups tumble around on their den just meters away from us are all movie-worthy moments that we got to experience firsthand. The day ended off with a comparatively boring (if you could call anything in the arctic boring) sunset safari along the Hudson Bay and a strict order to get as much sleep as possible before our super full day tomorrow. That’s an order that I haven’t quite been following, as I sit here with my cup full of dry cheerios blogging, surrounded by five rooms of sleeping Global Explorers people and many more rooms of sleeping scientists, so with that I bid you all goodnight. Every day out here is just more beautiful than the next, and I have full confidence that tomorrow will be incredible. Webs told me that each day at Nester 1 is better than the day before. After days of polar bear sightings, beautiful hikes, and endless conversations and laughs I found this statement hard to believe. How could these days possibly get any better? But Webs, as usual, was right. Today was our last day at Nester 1. We woke up to a glorious, warm, cloudless day, the best weather we had seen all trip. As usual, crammed into the kitchen was an impressive amount of teenagers, and an even more impressive amount of food, including pancakes, bacon, sausages, toast, potatoes, eggs, fruit, yogurt, cereal, and lots of nutella. Being our last day at the camp, rather than field work, we had a day of hiking. The first stop that we made was the Tetons, two small mounds that form one of the very few landmarks on the very flat open tundra. Karyne, one of our awesome bear guards, explained the historical significance of the spot. The ground was covered with a thin light gray rock called chirt; apparently the pieces of chirt were remnants of tools used by the pre-Dorset peoples. One of the neatest things about the spot was a hunting blind, covered with lichen from age, set up facing a beach ridge where caribou are often found. After all taking turns laying behind it was time to continue our hike. After another long hike, with several stops for water and trail mix, we reached the coast. When we got there we clustered together on moss hummocks and got out our lunches. Like with any good meal in the arctic, we were entertained by a mother bear and her cub walking along the shore of the bay, and a red arctic fox poking out of its den. While eating and watching we had a conversation about traditional knowledge and its relationship to western scientific knowledge, and how the two can interact. I found this particularly interesting to think about as a group of people doing research based on traditional western methods. During our conversation the tide had gone from its highest point, to very low. The beach had expanded almost all the way to the horizon. One of the most exciting things was walking across the ground that had been covered by the Hudson Bay a few minutes before. The ground was covered with fossils of Cephalopods, ancient squid like creatures that had lived in the bay years ago. Naomi was the first one to find one of the big cork-screw like fossils and at the time we all crowded around admiring her find, but after a few more minutes of walking we were spotting them everywhere. For many of us, parting with our new found treasures was very difficult, but because of the National Park status, we had to leave the Cephalopod fossils behind. We hiked back and arrived at Nester 1 around 6:30. One of the highlights of my day was preparing dinner. With peanut butter jars as rolling pins, a group of us managed to put together 9 pizzas with toppings creatively based on what foods we happened to have left. While some of us cooked, others laid out tables outside and made centerpieces of fireweed and other flowers. It was a real feast. After toasts were made, raps sung, and all the pizzas gone, we listened to Jill, another of our awesome bear guards, tell us about her adventures as a member of Parks Canada, two birding trips in particular down both the Broad and the Owl River. Her stories are truly incredible. All of the girls ended the day under the stars. Rather than sleeping in the tents as we had for the past four nights, we decided to lie on the porch and count shooting stars and fall asleep under the Northern lights. It was a perfect end to a perfect day. After spending the night before looking up at shooting stars and the Northern Lights, we awoke around 8 am to a nice warm breakfast of bacon, sausage, eggs, and potatoes. Around 10 we prepared our lunches, and set out to our last site at Nestor 1, which was about 2 km away from Nestor 1. After completing our site in Wapusk National Park, we all ate our lunches while lying on the arctic tundra. Once all of the lunches had been eaten, Jim Roth lead us to one of the fox dens he was monitoring, but our journey was interrupted due to sighting of a mother polar bear and her two cubs along the way; the bears were roughly 250 m away. After our break we continued our path and the polar bears sauntered off in the opposite direction. When we were within 50 m of the den Jim spotted an arctic fox relaxing near the entrance to a tunnel, in consequence we began to approach slowly. Once we were 10 m away we were able to obtain Jim's den camera, which was crushed by the polar bears that we had seen before. The arctic fox didn't seem to mind our intrusions, but as the group edged closer for better pictures it jumped into a tunnel. Saddened that the fox had gone into its den we began the exploration of the top of the den. After a little exploration, a few members of our group decided to sit on a nearby ridge for a couple of hours and try to figure out the number of pups in the den, while the other members of the group went on a 4.1 km hike to a couple of dens. At one of the dens Jim then gathered some tissue from a gosling to use it to compare it to the foxes diet, afterward some people in the group gathered some dirt samples from the den and the ground 50 m away for Jim to compare nutritional values in the soil. Then our group split once more where one group decided to lounge on the tundra by the den while the other group went to explore a nearby den. As the group from the nearby den was returning to the group that had been lounging, we managed to find a meadow vole. Despite being apart, the two groups merged again and began to walk towards the ridge where they left the third group waiting. The problem was that the group waiting had already been waiting for over two hours and were well on their way to Nestor 1. When the den watchers arrived at Nestor 1 the other group had just arrived at the 1st den where there seemed to be 8 juvenile foxes, but the watchers only saw 5. We quickly passed the fox den and continued the path home, and as we were retracing our steps we were overjoyed to see the polar bears from earlier today had returned to their original spots. We took a couple more pictures of them and continued our trek to Nestor 1. Along the way, as we were looking around we were surprised to see a group of three polar bears, that looked similar to the group we had seen before, walking parallel with us roughly 1 km away. Later, we took a quick break to watch the sun set, and arrived at Nestor 1 around 9:30 pm to a warm dinner of fajitas and hamburgers. We were then ushered into our beds so we would be well rested for our trip to Cape Churchill tomorrow, our final full day at Nestor 1. "There's a mum and cub out by the lake"
funny enough, close to where we had wanted to do a transect today. Now not being able to go out to do the transect, we stayed at camp till lunch. Churchill (A place known for polar bears). and also to soak up the beautiful sun rays. dinner cooked by Jill and the others that did not join us on the hike was ready. a delicious cake as our dessert. The second day at Nester One was a blast! Webbs and Dorothy kindly lent us an extra hour and a half to sleep in the morning while they made a super delicious breakfast of eggs, sausage, and toast. It has rained for two days in a row now, and people’s fingers were getting chilly. Before we started our fieldwork we all took a moment to take in our surroundings. We closed our eyes and listened. We listened to the wind whistle above our heads, and the monotonous pitter-patter of the rain against our jackets. We plugged our ears and focused on the smell of wet grass. We opened our eyes and took in the ripples in the pools of water that reflected the grey sky. The fog clouded our vision after a couple miles, and it just molded into the sky. When you first look at the horizon, all you see is dull green and yellow. However, when you really pay attention you can see that there are tons of different colors. Taking the moment to really understand that we have such a great opportunity to be a part of this wonderful place is really important because some people will never get the experience of being in a place as beautiful as the Arctic. Being here is a once in a lifetime occasion, and we are all trying to take in as much as we can before we leave, so that we can leave with so much knowledge about this breathtaking landscape. After we soaked in the tundra we began our fieldwork in the fen, which was 1.3 clicks out from our base, Nester One. As Naomi and I were getting down the Macro data, which means we were calculating the percentages of vegetation categories, we had to keep switching off writing down the data because we could barely hold the pen. It was very wet. Fortunately for most people, their fingers were the only parts that were cold. We finished the Fen and as we were walking back to Nester One we spotted four foxes playing at their den, and we stopped and stared at the small, cute, and furry wildlife for at least 45 minutes. I could have stayed there for three more hours. When we got back to Nester One we had lunch, and then a group went out to one of Jim Roth’s fox dens while some others stayed to make dinner. After we ate our delicious dinner of perogies, which is dough stuffed with cheese, potatoes, and bacon, Jim Roth showed an excellent presentation about indirect and direct influences on the animal food webs. He mostly talked about arctic foxes, lemmings, and geese, and how they directly and indirectly affected each other. We learned so much, and afterwards we reflected on how we, as people from all over North America, connect to the tundra. After hearing wonderful experiences, we all ate a super delicious desert of peach cobbler with dream whip as a super nasty delicious topping. Julie and Dorothy kicked us out of the kitchen at around 12, and some rapping sessions proceeded in the tents. It was a wonderful day, and everyone learned a lot about themselves, and the arctic. Our first day at Nester 1 was jam-packed, as you can tell by the fact that I’m writing the blog post for that day the next morning. We started the day by waking up pretty early, and rushing around to make sure everything was packed and ready to go. We stacked all our bags and many, many boxes of food into the yellow van, and then packed ourselves into our two vans to head out to the helicopter landing site. The helicopter itself was pretty small, with 5 seats in the back and one seat in front for passengers. It took 5(?) trips to get all of us and our gear out to the compound. I’ll admit I was a bitapprehensive about the flight – I hadn’t been in a helicopter before, and really had no idea what it was going to be like, especially considering it was freezing cold and raining the whole time. The pilot had said during our safety briefing that he preferred the helicopter to a plane, and I understand why now, having ridden in one for 20 minutes that felt like 5, it was so incredible. It was infinitely smoother than a plane, and felt much safer. The view flying over the miles and miles of wetlands, though a bit obscured by the rain, was amazing – you could see for miles and miles, all the while realizing that the only living things on the ground for those many miles were animals and plants. When we got within sight of Nester 1, I realized that I’d almost forgotten why we were in the helicopter in the first place. But then we landed, and getting inside the fence and cheering while greeting everyone who had arrived earlier, I remembered in an instant why we’d all been so excited to get out here. I was in the second to last flight in, with Kevin, Michael, Akio, Anna, and Emma, and by the time we got to Nester 1, the tents had been (mostly) set up, and all our field gear was thrown all over the floor in the “classroom” space. Nester 1 is a place that upon first glance looks kind of barren, but it only takes 5 minutes of being here to feel like it’s the most comfortable place you’ve ever been. There are two main buildings, the kitchen and the bunk house/classroom, a smaller restroom building, a couple sheds, and a large open space in the front of the compound with a basketball hoop. The whole compound is boxed in by a tall wire fence, which is very strong and bear-proof. There’s also a deck above the kitchen, accessible by a staircase, which gives you a great view of the entire surrounding area for miles. We pitched a bunch of tents in the area out front, which most of us sleep in at night (though there’s plenty of room for everyone inside, if people were to get too cold). Before going out in the field, we gathered in the classroom, which is a small room with a couch, several chairs, and a few tables. We’ve got clotheslines too, for hanging up all our stuff to dry. It’s got a small propane heater in the corner, which makes the whole building really cozy. A single hallway leads off into the bunk area – six small rooms, three on both sides, with bunk beds and shelf space – though now that we’re moved in fully, they look more like giant closets into which we’ve dumped all our clothes and things. The kitchen building is always warm, and it feels so wonderful to go in there after several hours of cold, rain, and wind. It’s small, but cozy – two walls are floor-to-ceiling shelves, one completely full of food, and the other full of pots, pans, cups, plates, and other eating/cooking materials. One wall has a sink, stove, and oven, and filling the middle of the room is a picnic table big enough to seat most of us. It’s comforting to go in there and have hot chocolate and snacks, and just hang out with other people. When we arrived here, the first thing we did was dump all our stuff and get situated. Then we split up into two groups – one group got back on the helicopter and flew out to southern Wapusk to a bog site, and the other went out to a fen about 300 meters from camp. The bog site group didn’t get back to camp until dinnertime, but they said that even through the horrible weather, it was worth it. They found a polar bear day bed, which is pretty much what it sounds like – a polar bear will dig itself into the peat layer, which creates a big hole in the ground that it can sleep in. They all got into it, which they got a picture of J. The fen group hiked out and took data at our first fen, which took much longer than our bogs had because we weren’t familiar with the scientific names of the fen plants yet. In addition, the active layer is much thicker in fens, which means that it takes more work to probe, which in turn means that it takes a longer time to gather all our data. We had a good time, even though the weather got pretty nasty. Once we’d finished there, we split into yet another two groups – many of us went with Jim Roth on a longer hike out to some fox dens he’s been monitoring. They collected some cameras he had set up – the site was really cool, because the foxes kill birds right around the den, so there were around 40 bird carcasses there. When we all reconvened at camp, the people who had stayed behind had made a wonderful dinner – including fresh from scratch garlic bread rolls, credit going particularly to Maddy and Karyne for those! After dinner we gathered in the classroom, where Jill (from Parks Canada, who’s staying with us here) gave a presentation about her job here and told us a lot about the park in general. Fun fact: Wapusk is the Cree word for polar bear. Adam also presented the powerpoint from ArcticNet last year, just to get everyone on the same page about our project here. Following that, we were so tired that we got straight to setting up our tents with tons of foam pads and blankets. All our days here have been so packed with activity and adventure; it feels like I’ve spent weeks here in Canada, when in reality it’s been less than a week, which is kind of insane. I feel like I’m never going to want to leave Nester 1. Today was amazing. Most of us woke up at around 6:30 or 6:45 and had a great breakfast. The meal included pancakes, freedom toast, oatmeal, and peaches if I remember correctly. After that we all gathered our gear and then met in the classroom to discuss the plan for the day. Since it was the second day everyone felt comfortable with what was going on and everything ran smoothly. Today we went to Twin Lakes and Richie Bog. Our study of the first bog of the day went by faster than yesterday, and we ran through the next site way faster than that, but worry not my group and I and the other groups I saw were still taking enough time to carefully collect data at each of the locations. The hike both there and back was not to wet and also shorter than our hike yesterday. After we had finished our data collecting we returned to the CNSC (Churchill Northern Studies Center) and prepared for snorkeling in the Churchill River and Hudson Bay with Sea North Tours. I think that this was the first time many of us had been snorkeling WITH BELUGA WHALES!!! The whole experience from donning our wet suits to getting back in the vans was amazing. The whales were very curious and relatively friendly. They seemed to like us more when we were inside the boat, but it was a great experience all the same. Big males could be seen in large groups off in the distance and some of them came very close to the boats and checked us out. What really surprised me was that most of the whales that came really close were mothers with their calves. One could tell the difference between the mothers with their calves and the others was through the color and size of the whales. We learned that beluga whale calves do not turn white until about five years after they are born. These little things resembled dolphins and rose and dove back down in the waters in sync with their mothers. That was truly amazing for me. I am sure that none of us will ever forget it. Just as a reminder to all of our readers we will be away from wifi while we are at Nester One for the next few days and we will not be uploading block posts each day. Tomorrow, hopefully, we ride to the fantastic and faraway Nester One research facility. WE GET TO RIDE IN HELICOPTERS!!!! Today was our first full day of fieldwork; we started out by getting up at 6:30, having breakfast, prepping gear, loading the vans, and leaving by 9:15. By about 10:30 we arrived at the site in the vans where we would cross the fen, we started our ~2k to the location of where the data was collected previous years; the hike was wet and buggy, but went well. 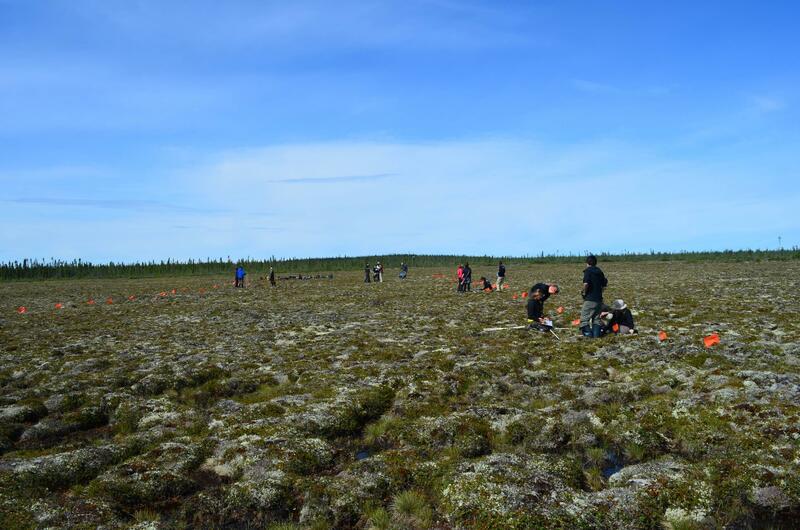 When we arrived at the site, everyone was super excited to get going on the data collection in a bog; the first part was placing the transect, two sets of 26 quadrats each one by one metre , and one metre apart, marked by a flag. (picture). We did this in two locations near Ritchie Lake, taking lunch in between each. 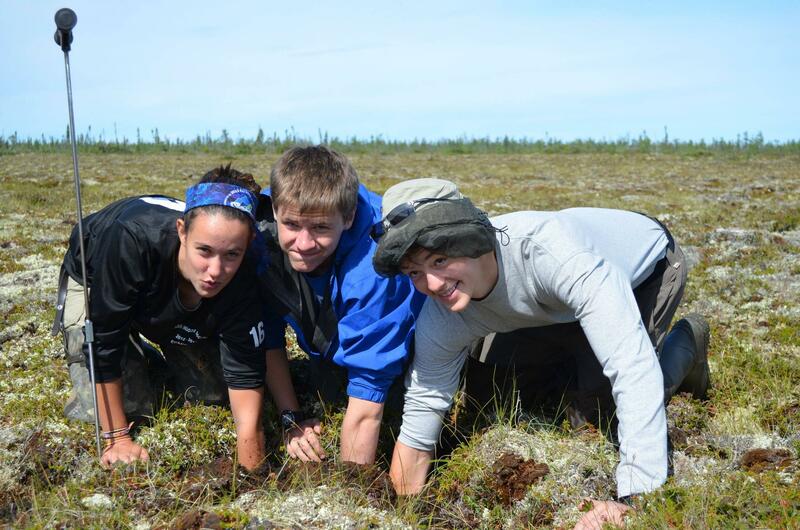 One thing that was really cool was when we decided to dig down so that we could actually feel the permafrost with our finger (picture) (L to R, Natalie, Tim, and Michael). After the long hike out, and a short drive we arrived at Twin Lakes and most of us seized the opportunity of swimming. After returning to the CNSC, dining, and washing up, we drove to Churchill and met up with Carolyn, a Sayisi Dene woman who remembers the relocations of her people, the aboriginal people of Northern Canada. She spoke of how her family was forced to move away from their homes, and was abused by the system. Carolyn told her story of governmental abuse caused by family troubles, explaining her recovery. She concluded by making the point of how one should be who they are. On the way back from Churchill, we stopped at an old plane wreck near the Churchill Military Camp, where we stayed for the sunset. Later we made a campfire, and reflected on our discussion with Carolyn, taking about how we can learn from her story, as well as the story of the Indigenous peoples in Northern Canada. We later returned to the CNSC at close to 11:15, and went to bed, in anticipation of a full field day to take place tomorrow. One thing that really worked well for me today was plant identification. For the past few days we have been working on learning the scientific names of lichens, shrubs, and herbs that grown in bog areas; being in the field seeing the plants and identifying them is a much easier way to learn and memorize the names, rather than just studying them out of a book. We have been taking pictures of the trip as we go, and have created an imgur account (open picture dump site) which can be found here I, and others on the trip, will try to continue to add pictures daily. Today has been crazy! The train got into Churchill at around 8, making a potentially 24 hour train ride only 15. Leanne from the CNSC (Churchill Northern Studies Centre) was waiting for us at the train station, so we loaded in our luggage and headed out, taking in the incredible arctic view as we crammed as many plant names into our heads as possible, it took a fair amount of multitasking, but we managed. When we got to the CNSC we started out with Leanne talking through how everything worked, where we could go, and where we couldn’t. After she spoke, she showed us around the center to give us an idea of where everything is. Then we dropped our stuff in our rooms and continued on to polar bear safety. Ryan taught us about gun safety and showed us a video about how to be as safe as possible around polar bears as we snacked on the massive amount of food that was left from our food that we had gotten for the drive and train ride. Finally, it was time for lunch, our first real meal in what felt like forever. After lunch we got all of our stuff together, talked through some methodology, and headed out to the field. We practiced doing micro and macro in small groups and eventually compared our results with other groups to look at the margin of error and talk about why it was there. When we got back to the CNSC we had dinner (the food here is great), and at 7 we went back on out to the bog we had been at earlier to practice setting up a transect and set up a motion activated camera to watch some caribou guts that we had discovered before hand to see what wildlife will come and nibble on them. Once we were done with all of that, we piled back into the vans and drove up to the Hudson Bay where we watched the sunset both as a group and individually during a thing that we do called “In the Moment Now” where everyone sits separated a little bit and spends some time just looking around and having some time on their own to appreciate the amazing area we are in. We spent some time hanging out there before we came back here to the CNSC to go to bed. All in all it’s been a great day and everyone’s happy to finally be here. Smiles have expanded today. This morning, at 4:30 am when our iPhone alarms sung out, the smiles were pretty pathetic. But now, as the East side begins to darken and the west side glows the glow of sunset, the smiles are much bigger and brighter than the orange slices stuffed inside them. Despite being confined to the seats of either a car or a train today, our group of 14 students has begun to reach out and congeal like the spilled syrup on the train café car table that I’m writing this on. Kids who didn’t know each other yesterday are happily competing in intense card games, while others comfortably mocking each other like old friends, while still others are getting cozy and falling asleep on each other. We truly have a group of remarkable students. Maddie has spent nine years learning the art of Japanese dance, Chris is a ski instructor, Akio is a phenomenal musician, Annika picks up games incredibly fast and keeps the less mature of us in line, Natalie has a true heart of gold, Will continues to seep out humor, and Thomas’ quiet manner brings a calming peace to the group. I feel so lucky to know that my next two weeks will be filled with these wonderful, multitalented human beings. Our long drive from Winnipeg to Thompson was broken up with two stops: one to pick up Ryan, our mentor/bear guide/source of amusement, and one at Pisew Falls. There after stretching and taking in the scenery we shared our motivations for coming on this trip. We are all here for different reasons—to prove something, to understand something, to question something, to try out something, to test something—but regardless of the primary driving reason, we are all here to learn, and to learn together. The “learning together” is already beginning. As I write this, I hear the occasional lichen name shouted out. Returning students are testing new students on the scientific names of the species that we’ll encounter on the tundra. The names themselves bring laughter—penguicula vulgaris, and basigiomycota are two favorites. This is my second time on the train from Thompson to Churchill. I have already seen the dark delicate clouds suspend over silhouetted spruce trees, but again, I am entranced. This trip, two years ago, changed my life. Since then, I have not gone a single day without thinking about what I saw here, and certain images have influenced decisions that have made me who I am today. I am an immensely different person than I was two years ago, and I could not be more excited to return to the place that changed me, and changed me for the better. Before I left, my friend Megan, who came to Churchill in 2011 and 2012, reminded me of the power of breath. I hope to fill my lungs to the maximum with the air here, and I am so excited to do that alongside everyone else. It’s the day before the trip and some part of me can’t really believe that I’ve getting on a plane to go to the arctic tomorrow. The arctic trip has been this object in the back of my mind since the summer began, something akin to the rabbit and the wolf puzzle/riddle or what ever you want to call it. The one where the wolf cuts the distance between himself and the rabbit by half so as to get to the rabbit but is never quite there. I was the wolf approaching the time for the trip getting closer everyday but also like the wolf never quite getting there. Until tonight. Right now thoughts of worry, excitement, nervousness, anticipation keep me awake even though I should just close my eyes and drift off so tomorrow I can get up at 4:00 tomorrow. So I’ll sign off for now and try to get some sleep. We all woke up at around 4:00-4:30 sleep deprived and mad our way to the airport. Getting through security was fine without many bumps and the plane only had a few minor delays. 1 hour and 47 minutes later (according to the pilot) we arrived in Chicago and we made our way to the gate but since the seating area didn't have enough space to fit 10 people we moved off a little ways. We quickly parted ways, some people to get breakfast pancake sandwiches and others just to walk around, and some how we managed to all get back together in time... just in time, we were the last ten to board! When we got to Winnipeg, Will almost lost his passport and we found the Northwest kids. We checked into the hotel at about 3-4 and had lunch by the pool that had a huge water slide and a hot tub (not to mention it was dinosaur themed). At about 5 we all left for Donna's house (one of the mentors coming on the trip) where we met the Kelvin kids and had dinner, talked about expectations and did ice breakers (not the candy). Finally, after a day that seemed to be like forever, we've all made it back to the hotel and are getting to sleep and trying to get our lights out before 10:30 to get maximum sleep before the 4:30 wake up call tomorrow. © ISAMR. All rights reserved.